- Seven from Hirak: (1) Ismahan Al-'Alas, (2) Saleh Taher Al-Isa'ey, (3) Abdulaziz Abdul Hameed Al Maflihi, (4) Sheikh Tarek Al Mohami, (5) Mahmoud Shaief Hussein, (6) Mustafa Zain Al-'Aidaroos and (7) Khaled Ba-Ras. 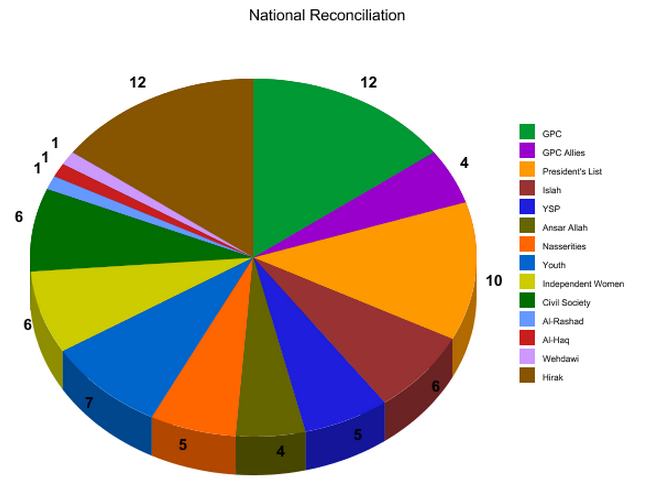 The total number of participant should be 554; however, after several revisions to different lists the following charts are based on a 555 member conference. In this committee, Hirak members have the biggest share. Followed by GPC, then YSP and Islah. This category is dominated by GPC, then Hirak then members from the President's list. This category is where child marriages and other women issues will be discussed and it has 36 women and 45 men. This is another group where Hirak, GPC and the members from the President's list have the most representation. Civil Society is represented better in this category than most of the other working Committees. Like the Southern Issue Committee, this group is represented by people who are affected most by it: Ansar Allah (formerly referred to as Al-Houthis). However in comparison, they are less represented since the committee is composed of 48 members (Southern Issue 40) and only 10 are from Ansar Allah. Also, Hirak has equal members to the GPC (6 seats), while Ansar Allah had only 2 seats in the Southern Issues Committee. This group will be looking at constitutional reform. Half of the members in this group are from Civil Society, GPC, GPC's Allies, Islah and the President's list. Possibly the least group with Hirak representation. The main topic in the Good Governance Committee is Civil service reform. It seems to be a fair representation of the members chosen for the dialoge. Like expected, women are represented fairly in the development, independent/social issues, human rights and freedom, and national reconciliation group. Women are less likely to be present in serious issues like security and military, Southern and Sa'dah Issue. The final list of members in the Southern Issue is challenged by the Southern Hirak and will be issued at a later point by the NDC. All these representations are susceptible to change.